At the southwestern tip of Sweden, just across the strait from Copenhagen, Denmark, lies Sweden’s third most-populous city, Malmö. 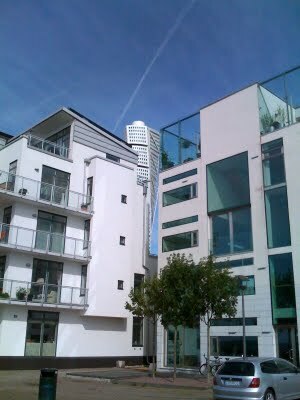 Malmö has a population of a quarter-million residents, sitting in an urban area of about 635,000. These Swedes, in the province of Skåne (pronounced Skoa-neh), speak a crazy dialect of Swedish called Skånsk. It sounds like a hybrid of Danish and Swedish. Skåne was actually part of Denmark at one time, but to the surprise of some, that changed somewhere around 1658. Sometimes news takes a while to spread. On a clear day, Malmö and Copenhagen are visible from each other’s shores. The Öresund Strait which separates them is just 4 km (2.5 miles) across at its narrowest point. Today, the countries are joined by the Öresundbron, a relatively new bridge and tunnel network which opened ten years ago this summer. At a cost of more than $3 billion, this highway and railroad connection was completely financed by a company jointly owned by the Swedish and Danish governments at no expense to the taxpayers. (That was $3 billion when dollars were actually worth something. Today it would be in the neighborhood of $5.6 billion.) Vehicles pay a toll to access the crossing and the project is expected to be paid for by 2035. Before the ribbon was cut on the bridge ten years ago, ferries were the primary means of moving people and vehicles between the two nations. But on July 2, 2000, trains carrying King Carl XVI Gustaf of Sweden and Queen Margrethe II of Denmark (the King’s cousin) met on the artificial island of Peberholm about halfway between the crossing. A ceremony there officially opened the span to traffic which now amounts to nearly 30 million crossers per year. Like almost all European countries, Denmark and Sweden share an open border. Travelers are not checked or required to stop when passing from one to the other. For decades, Malmö was most easily recognized by the image of the Kockumskranen, a monstrous, seaside gantry crane which could move 1,500 tons of freight to and from ocean cargo ships in a single lift. In the late 1990’s when plans were announced to remove the crane, a local movement began to establish a new icon for the city. 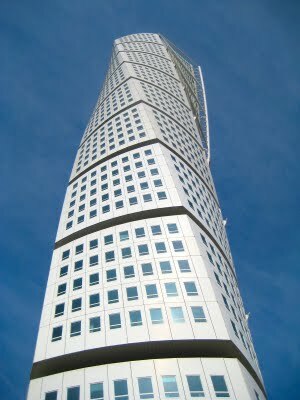 That movement resulted in the unique, twisting, 54-story apartment skyscraper which towers above the city today. A picture is truly worth a thousand words when talking about this piece of modern architecture. 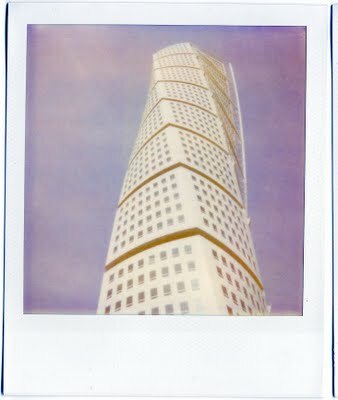 As the tallest building in Sweden, the Turning Torso was competed in 2006, rising 190 meters (623 feet) above the harbor and offering sweeping views of Malmö and neighboring Denmark, weather permitting. 147 residential rental apartments make up the bulk of the building, filling the 14th to 52nd floors. Offices and conference space make up the rest. 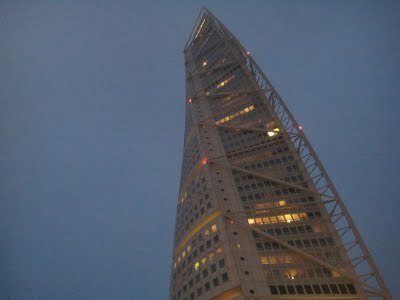 The Turning Torso was designed by famed Spanish architect Santiago Calatrava. His long list of impressive credentials includes the 2004 Olympic Stadium in Athens, the Milwaukee Art Museum, and the new PATH railway station at the World Trade Center site in New York. His work is laden with flowing, sweeping curves and clearly displays his training as both a sculptor and civil engineer. The Torso is based on one of his earlier sculptures and, in fact, other pieces of his artwork decorate the interiors of the tower. Calatrava is also the designer of the now-on-hold Chicago Spire, a much more imposing swirling tower that is intended to be the new tallest building in the United States. Financing problems have plagued that project. Calatrava now has a lien filed against the building, claiming the developer owes his architectural firm more than $11 million. 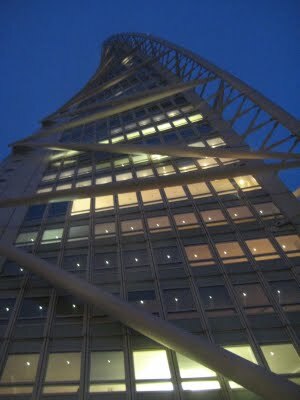 Calatrava’s twisting building designs present a laundry list of uncommon construction challenges. Reckon that’s why they pay him $11 million to draw pictures all day. 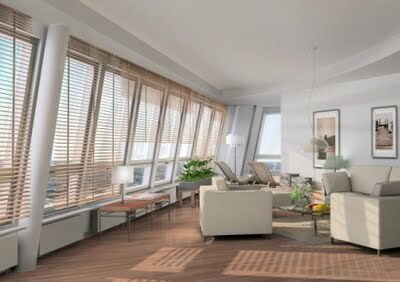 Aside from the top and bottom floors, the floorplans for most tall buildings and skyscrapers can be identically configured and repeated throughout the building. Generally speaking, the 4th floor and 23rd floor of a building – and all floors in between – are the same shape and have the same layout. 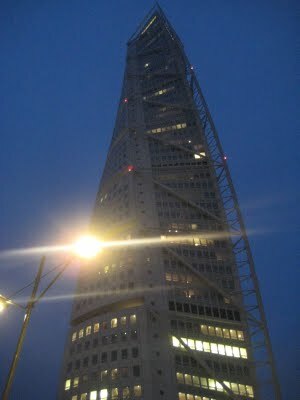 In swirling designs such as the Turning Torso and Chicago Spire, because of their bending and curved silhouettes, the dimensions and shape of each floor are unique. 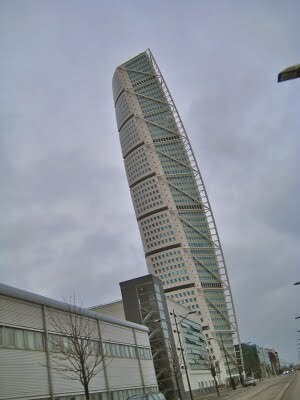 That is illustrated fairly well by looking at the building from above, as in this satellite view of the Turning Torso. Perhaps more compelling than the outward appearance of the Torso are some characteristics of what it the building actually does while quietly watching over the harbor. The building’s developer and owner, HSB, participates in a program called Detoxifying the Construction Business which influenced many of the materials chosen during construction. The Swedish mindset of conservation and efficiency no doubt also had an effect. 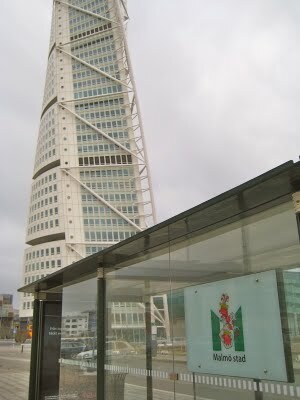 To that end, Turning Torso is outfitted with an active recycling system that converts tenants’ discarded organic waste into biogas to fuel some of Malmö’s city buses. And not only does the Torso generate energy for buses, but the building itself is powered entirely with locally-produced renewable energy. In addition to the unveiling of this distinctive, new tower, the area of Malmö surrounding the building, Västra Hamn (“Western Harbor”), has undergone a remarkable reinvention in recent years. Less than a decade ago, this neighborhood didn’t even exist in its current form. A major effort to reclaim the shoreline has essentially erased a run-down oil port and industrial zone which previously occupied the space, and transformed it into a modern seaside residential area. Today, large, open, green fields give way to rocky beaches and pristinely clean water. 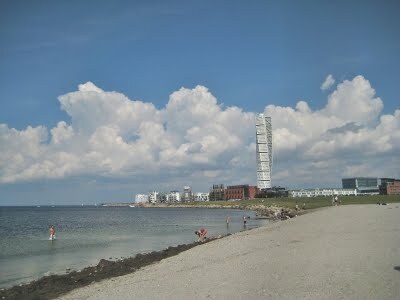 Malmö’s residents as well as tourists flock to Västra Hamn’s beaches in the summer. A long, shoreline promenade was also installed during the neighborhood’s redevelopment and has proven to be popular at all times of the year. In the summer it is populated with people of all ages. The walkway is dotted with small shops and a few vending carts offering ice cream, coffee and snacks. Västra Hamn includes a number of other notable tenants who have moved into the area. 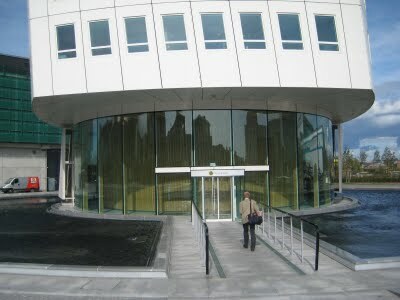 It is home to Malmö’s City Archives, the Media School, the World Maritime University, an ice skating rink and sports center. I have visited the area several times in the past couple of years, both during the summer and winter. 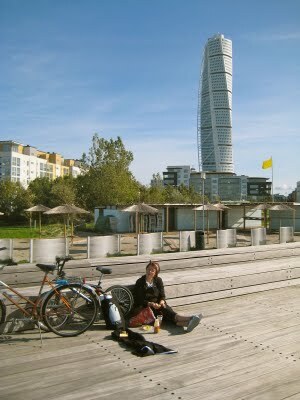 In 2008, my Swedish friend Emma (who lives in Malmö) and I rode bicycles from her apartment to Västra Hamn to indulge in an oceanside picnic on a crisp and perfect late summer afternoon. (Some readers may know that I fancy myself a semi-professional picnic planner.) That sunny day was just a few weeks after Emma and I had visited another famous skyscraper, the Empire State Building, with our mutual friend Wictoria. Good times. 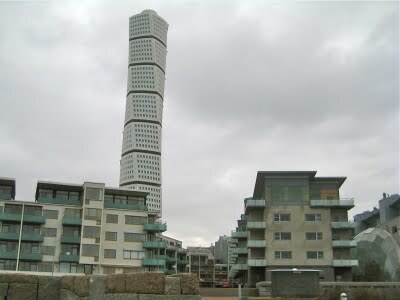 The Turning Torso, if located in New York, would be that city’s 71st tallest building. Last summer I was at Västra Hamn again when my buddy Maggie from Louisville was visiting Sweden. On an unusually hot day last August, we enjoyed a refreshing swim in the crystal clear water. Emma was out of town that time, but she was nice enough to let us trash her apartment and socialize with her capricious cat, Skrållan, while she was away. 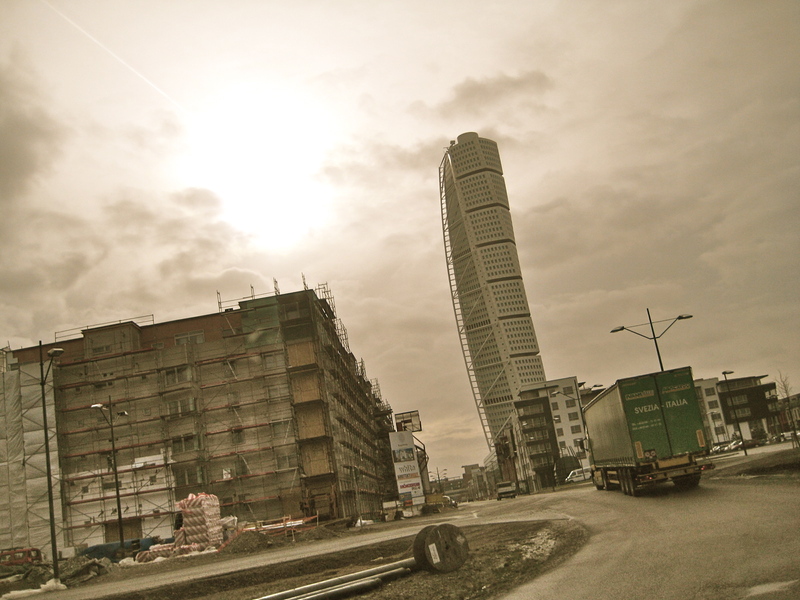 The first time I laid eyes on the Turning Torso in February 2008, the weather was as swirling as the building itself. In freezing rain, I scoped out the tower from every angle. When you’re standing on the ground looking up at the edifice, it truly does not look like it should be standing. The sweeps and angles it takes seem just a little too drastic. I have heard that residents have reported the upper floors swaying a bit in the wind, but most tall buildings do have some flexibility. 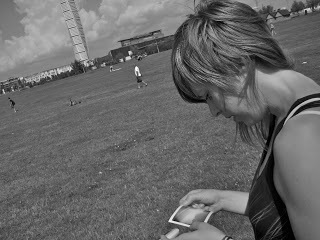 Not everybody drops in on the the Turning Torso in the same casual and relaxing ways I have. The building made news in August 2006 when, like an extreme sports version of Philippe Petit, the Austrian skydiver Felix Baumgartner parachuted from a helicopter onto the the top of the building, then jumped again to the ground. A video of that craziness can be seen at this link. 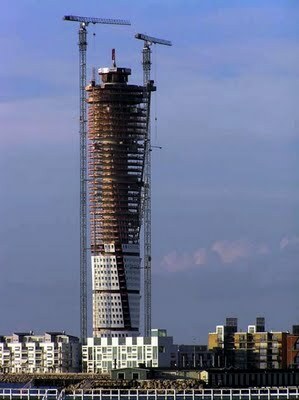 The last five views are from the HSB Turning Torso website. 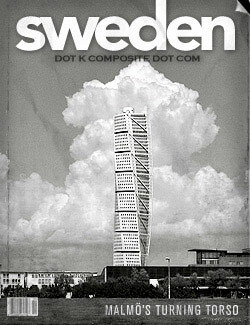 The site is in Swedish, but worth a look whether you can read it or not. Wow is all I can say what an amazing achievement. Definately a modern day wonder of the world. In my humble opinion. Thanks for the story.